Spotify Premium now available on D-Link Boxee Box streamer | What Hi-Fi? 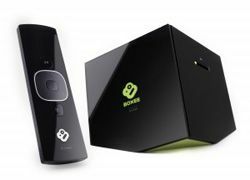 Spotify has today announced that its Premium music streaming service is now available on the D-Link Boxee Box internet TV device. Once connected to your TV, it enables streaming of internet content on your telly and playback of other digital media. To that you can now add Spotify compatibility, giving Boxee owners on-demand access to Spotify's vast music catalogue via their TV. There's also a custom Boxee app to control it all. You can read our full review of the D-Link Boxee Box here.